This type of seismicity is the language spoken by an actively-growing and unstable lava dome under increasing stress. The lava dome may well be headed for a collapse in the near future: it’s worth keeping an eye on the AVO Hut Webcam. 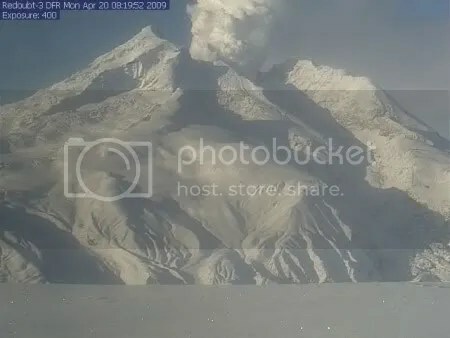 Further information from the AVO is that the volcano is producing a constant steam plume to about 4600 metres (15000 feet), with rockfalls on the dome putting a little diffuse ash into the emissions. Incandescence was visible after dark on the lower portions of the dome yesterday. Current activity at Redoubt volcano suggests that a significant explosive event is likely, though not certain, in the coming days. This event could occur at any time with little or no warning. Since about May 2 shallow earthquake activity beneath the actively growing lava dome of Redoubt volcano has been slowly increasing. The growing lava dome is becoming increasingly unstable. 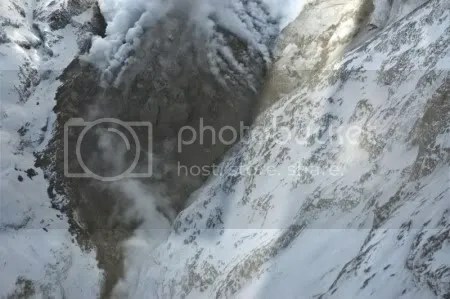 Should a significant explosion occur, the event will likely produce high altitude (>30,000 ft ASL) ash plumes, trace to minor ash fall in parts of south-central Alaska, lahars in the Drift River Valley, and pyroclastic flows in the immediate vicinity of the volcano. 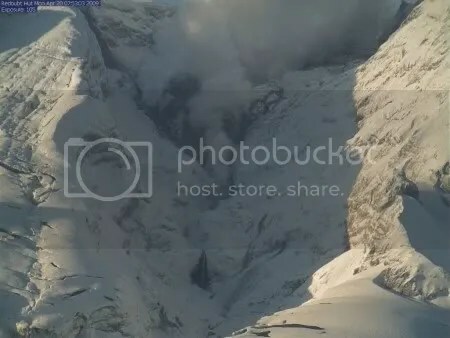 Mount Redoubt had a restless Sunday, showing a marked increase in seismicity which included ‘more frequent rockfalls and small LPs [Long Period earthquakes]’, reports the Alaska Volcano Observatory. 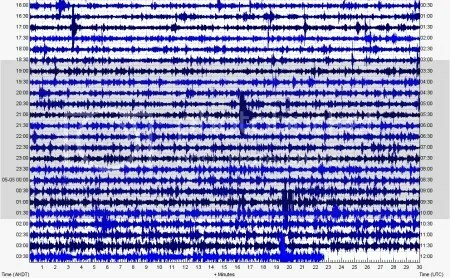 This kind of seismic pattern is consistent with the lava dome coming under increased structural strain as it grows – the volcano may be moving towards a dome collapse. The presence of ‘a persistent thermal anomaly’ at the dome indicates that fresh magma is still being introduced, feeding active growth. The latest AVO bulletin for Sunday (2009-05-03 21:08:50) reported that ‘A vigorous steam plume, rising to altitudes up to 18,000′ [5500 metres] above sea level, has been visible in webcam images throughout the day. Currently, this plume contains small amounts of ash based on web camera views, satelite data, and a pilot report. Seismic activity has also increased in the last 24 hours’. 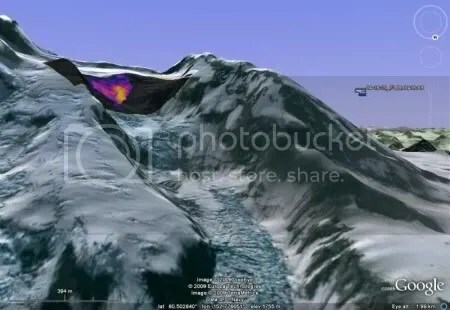 Recommended viewing: Akira Shirakawa has compiled a neat video showing the growth of Redoubt’s lava dome from 16 April to 1 May, which can be seen at YouTube (HD version also available). The Drift River Oil Terminal, the oil storage facility unwisely situated at the foot of Mount Redoubt, is to be drained of the remainder of its oil. Around 3.7 million gallons of oil was removed on 7 April, leaving about 2.5 million gallons, mixed with water, still in the tanks. A tanker will arrive at the terminal today to receive the remaining contents of the tanks. The transfer process is expected to take 48 hours. When the transfer is completed, water will be pumped in to stabilize the tanks. There are no plans to clean the tanks, because the site is too dangerous for people to be on site for the length of time the cleaning would take. ‘We are not prepared at this time to put our people on the ground for that duration whilst the volcano remains active’, said Rod Ficken, vice-president of Cook Inlet Pipeline Company, in a sentence impressively packed with redundant phraseology. The committee overseeing operations at the terminal announced on 21 April that it would not be re-opening any time soon. 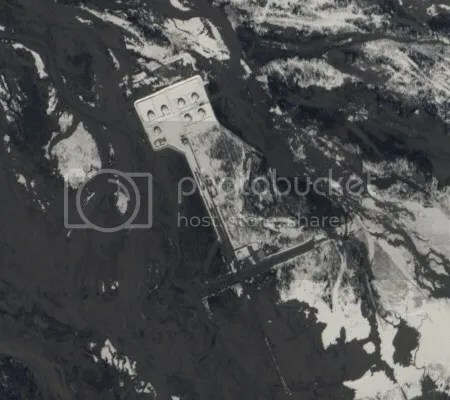 For clear evidence from satellite images of just how vulnerable the current location of the Drift River Oil Terminal is, take a look at these images at the Cook Inletkeeper site. Redoubt itself is still at Orange/Watch status, and is busily building its lava dome which, wreathed in steam, is now very prominent and well-defined (see picture below). 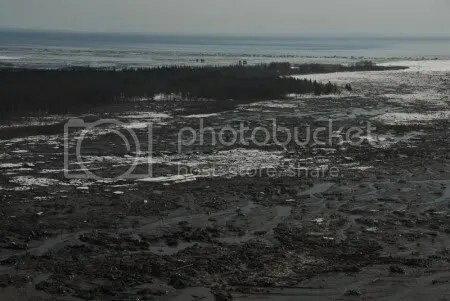 From the Anchorage Daily News comes a report that the Drift River Oil Terminal, shut down on 23 March and partially emptied of oil on 7 April because of the eruption of Mount Redoubt, will not be back on line any time soon. 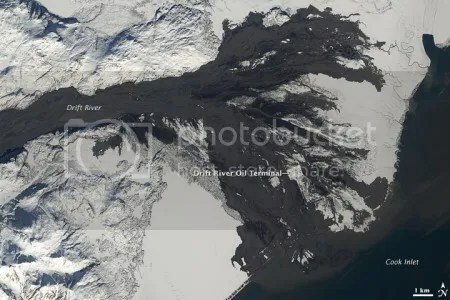 With Redoubt volcano still active and potentially explosive, officials have given up trying to restart the nearby Drift River oil terminal anytime soon, indefinitely idling about 10 oil platforms in Cook Inlet. ‘It will take as long as Mother Nature decides’, said a Coast Guard spokeswoman, Petty Officer Sara Francis. It’s unlikely Drift River can reopen before early fall, she said. All this can come as no surprise to anyone who takes a moment to look at a map showing where the terminal is located. What is surely most remarkable is that anyone has been trying to ‘restart’ the terminal with the eruption ongoing, or is now talking about this terminal being re-opened at all. Redoubt is still at Orange/Watch. The Alaska Volcano Observatory notes that seismicity remains elevated, and that a plume of water vapour and gas is moving to the south-west. 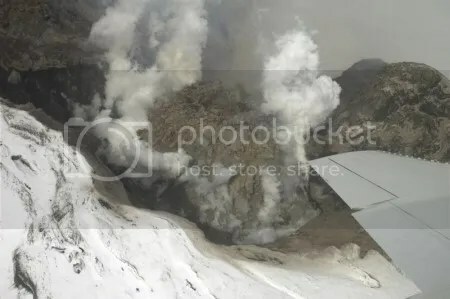 A gas measurement flight was carried out yesterday and the AVO reports that ‘scientists observed little to no evidence of significant lava dome growth since the last observations 4 days ago’. Posted by admin in Alaska, eruptions, United States, volcano images. The news from Redoubt is not itself dramatic. The eruption is continuing, the lava dome is building, there is a thermal anomaly at the dome and a continuous, low but vigorous steam plume. 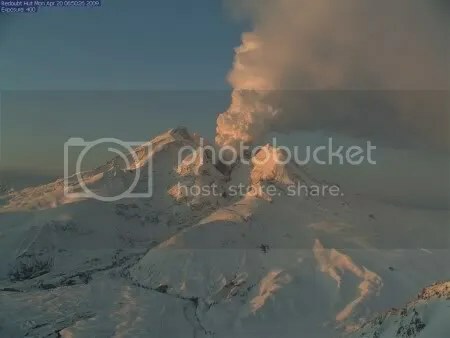 Posted by admin in Alaska, eruptions, Redoubt, United States, volcano images. 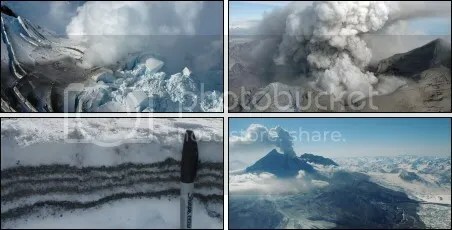 The Boston Globe has some stunning, and varied, images of Redoubt’s current eruptive activity in its ‘Big Picture’ feature. 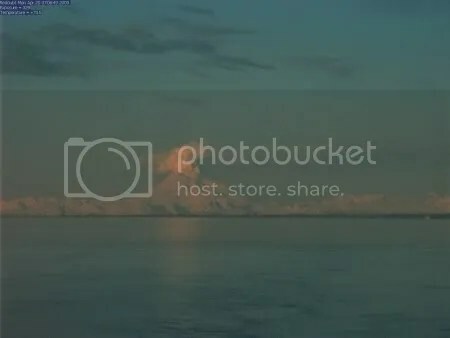 Lots of wonderful volcano pictures to feast your eyes upon: Alaska’s Mount Redoubt – The Big Picture. The Alaska Volcano Observatory reports no change at Redoubt, with the lava dome busily growing, low-level tremor and occasional small earthquakes, and a continuous steam plume to under 4500 metres (15000 feet). The eruption of Redoubt continues with varying intensity of ash and lava production from the summit crater. Additional significant explosive events with accompanying ash clouds, ash fall, and mudflows are possible and can occur with little or no warning. Visual, satellite, and seismic observations indicate that a lava dome is again forming in the summit crater. The character of current seismicity suggests that a sudden explosive eruption is not imminent. Present levels of activity are emitting only a very minor amount of ash that poses a hazard of limited aerial extent. Consequently, AVO is lowering the Aviation Color Code to ORANGE and the Alert Level to WATCH. AVO will maintain 24/7 operations in order to quickly detect renewed significant explosive activity and other hazardous phenomena. It seems that the transfer of some of the oil in the Drift River Oil Terminal tanks has been completed. The Anchorage Daily News (which has provided excellent coverage of this issue) reports that the tanker Seabulk Arctic completed taking on 3.7 million gallons of crude on Monday and has departed for Nikiski terminal where the oil will be delivered. About 2.5 million gallons of oil and sludge remains at Drift River. The Cook Inletkeeper site has more information about the Drift River Oil Terminal situation here.